Simple and stylish, this chic compact camera is packed with advancements that make it easy to get a great shot every time. Smart AUTO recognizes 32 predefined shooting situations then automatically picks the proper camera settings for you. Saving memories in breathtakingly realistic 720p HD is as easy as pressing the dedicated movie button. You'll see extraordinary resolution and fast performance with the 16.0 Megapixel Image Sensor and DIGIC 4 Image Processor, and capture more dynamic, exciting images with the 5x Optical Zoom with 28mm Wide-Angle lens. New Digital IS greatly reduces blur by recognizing the main subject and applying the best camera shake correction. 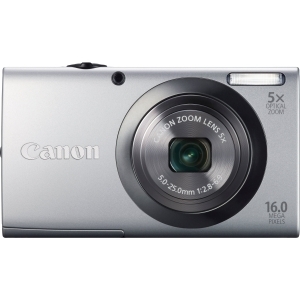 Easy quality that's easily affordable: that's the PowerShot A2300 digital camera!